Our return journey from Longview, Wash., to Moorhead, Minn., via Trans-Canada 1 enabled us””‚Carmel, 5; Junius, 9; Yoke-Sim and me””‚to get a good grasp of the geographic and demographic features of Canada. Sunday (3 Sept. 1989) was our ninth day out on the road since we started the tour. Our plan was to quit Trans-Canada 1 at Winnipeg, 571 km further to the east, and drive another 357 km south on Manitoba 75 and Interstate 29 to reach Moorhead. Saskatchewan, with its population of 1.1 million, is a sparsely inhabited province. Almost 45 percent of the province’s inhabitants live in the capital city Regina (pop. 210,000) and the province’s largest city Saskatoon (pop. 257,300), 257 km to the northwest of Regina. In terms of ethnic origin, 61 percent of Saskatchewanians identify themselves as British (26.5 percent English; 19.2 percent Scottish; and 15.3 percent Irish). German (30 percent) was the largest single ethnic group. (See Travels-61 for comparison with British Columbia). Originally a part of Northwest Territories, in 1905 Saskatchewan became the eighth province to join Canada. Regina (“The Queen City”) was the name that Princess Louise, the fourth daughter of Queen Victoria or Le Victoria Regina, gave the city in 1882 to honor the queen. Louise was then the wife of John Campbell, the Duke of Argyll (better known as Marquess of Lorne) who became the fourth governor-general of Canada (1878-1883). That the Reginans have kept the imperial name to this day attests to their willingness to be loyal to the British royalty. Just like the Victorians in British Columbia! Wikipedia asserts that Regina was a tabula rasa, without topographical features other than the small spring run-off Wascana Creek. Early planners took advantage of such opportunity by damming the creek to create an artificial lake to the south of the central business district and constructing the elaborate 260-meter-long Albert Street Bridge across the new lake. 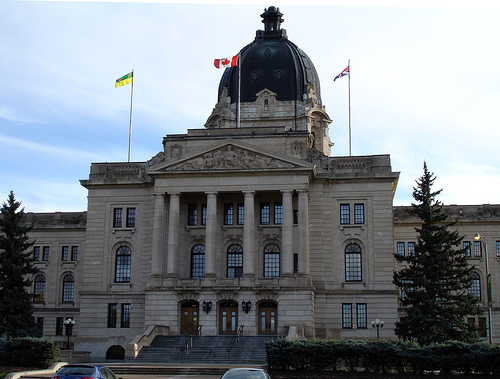 In 1906, Regina’s importance was further assured when the new province of Saskatchewan made the city its capital. Wascana Centre, created around the focal point of Wascana Lake, remains Regina’s signal attraction and contains the Provincial Legislative Building, both campuses of the University of Regina, the provincial museum of natural history, the Regina Conservatory (in the original Regina College buildings), the Saskatchewan Science Centre, the Norman MacKenzie Art Gallery and the Saskatchewan Centre of the Arts. Because of the pressure of time, we could not see all of them. After leaving Kings Acres Campground in the morning, we began to explore several of the tourist attractions in Regina although the Sunday closures restricted our choice of what to see. From the Kings Acres Campground, where we camped overnight, we started the day with a visit to the Victoria Square Shopping Center, where we stopped at the Safeway supermarket to purchase the food we needed for the rest of the day. Located in the heart of Regina’s East End, “the VicSquare Mall” was first opened in 1983. It currently accommodates more than 45 stores and professional services. A=Victoria Square Shopping Center/ the “VicSquare Mall”; B=Kings Acres Campground; C=Downtown Regina/ Market Square; D=Diefenbaker Homestead (Wascana Centre); E= Legislative Building (2405 Legislative Drive); F= Royal Saskatchewan Museum (2445 Albert Place); G=Royal Canadian Mounted Police Centennial Museum; H=Government House (4607 Dewdney Ave.). Then, we headed west to explore downtown Regina, including the Market Square, where the hustle and bustle of a normal weekday eluded us. However, we thought that we succeeded in capturing the essence of Regina by patiently visiting a few key attractions, which kept us in the city until 3 p.m. The star attraction we visited was the Royal Saskatchewan Museum (RSM), established in 1906 as a museum of natural history to “secure and preserve natural history specimens and objects of historical and ethnological interest” (Wikipedia). Between 1906 and 1945, the museum occupied several premises including those of the Provincial Legislative Building and the Normal School. After World War II, the provincial government built the current premises on the corner of Albert Street and College Avenue, the site of the abandoned Chateau Qu’Appelle Hotel, as a Saskatchewan Golden Jubilee project. Governor General Vincent Massey opened the new premises on 16 May 1955. To reflect the areas of devotion, the museum renamed itself the “Saskatchewan Museum of Natural History.” This title stuck until 1993 when it received royal designation from Queen Elizabeth II, and became the Royal Saskatchewan Museum (Wikipedia). “The museum had a very good display of geological development,” I wrote in my diary. The Diefenbaker Homestead (located 1967-2004 on south side of Wascana Lake. Current location: Sukanen Ship Pioneer Village Museum, south of Moose Jaw). Driving south on Wascana Drive, we stopped at Wascana Place for coffee. Crossing over to Lakeshore Drive, we reached the then site of the Diefenbaker Homestead. John Diefenbaker was prime minister of Canada from 1957 through 1963. His “homestead” was moved from Borden to Regina in 1967. He died in 1979 at the age of 84. The Provincial Legislative Building (2405 Legislative Drive overlooking Wascana Lake). Built between 1908 and 1912 in the Beaux Arts style at a cost of $ 1.75 million, the building was designed by the Maxwell brothers, Edward and William Sutherland, of Montreal. We joined a conducted tour of the building. Saskatchewan Legislative Building in Regina (4 March 2007). Government House (4607 Dewdney Avenue), constructed in 1889 as the official residence of the lieutenant governor for the North-West Territories. The vice-regal offices and residence were moved out of Government House in the 1940s because of the anti-colonial political climate of the time. In 1958, the original building was re-named Saskatchewan House. In 1984, the offices of the lieutenant governor (but not the residence) returned to the original building, which resumed the name Government House. It is now “a museum of the 1900 period under Lt. Gov. AmƒÆ’†’©dƒÆ’†’©e Forget, and a hospitality facility for government and non-profit organizations” (Wikipedia). A female guide gave us an excellent tour of the quarters. We ate lunch at the premises of Government House, which some believe is a haunted mansion. The Royal Canadian Mounted Police Centennial Museum (closed in 2006). Established in 1933, the museum operated in a number of facilities for its first 60 years. In 1973, Queen Elizabeth II officially opened the museum (on the site we visited) in honor of the RCMP’s centennial. The museum exhibited many artifacts relating to the colorful history and traditions of the RCMP. The museum closed permanently in October 2006, and the collection moved to the RCMP Heritage Center, a $40-million project. Its Phase 1 (located near the RCMP headquarters at 5907 Dewdney Ave.) opened in 2007. We left Regina mid-afternoon heading further east on Trans-Canada I intending to get as close as possible to Winnipeg, Manitoba. Indian Head (pop, 1,758), 78 km east of Regina, was our first stop. This town is the location of the federally operated Prairie Farm Rehabilitation Administration (PFRA) experimental farm and tree nursery that produces seedlings for shelterbelts. We visited the site and picnicked in the scenic premises. At Grenfell (pop. 947), 57 km southeast of Indian Head, we decided to skip the 51-km stretch of Trans-Canada 1 up to Whitewood (pop. 869) because we wanted to enjoy the scenic splendor of spur Highway 247 running along the northern shores of Crooked Lake and Round Lake. We stopped at the Crooked Lake Provincial Park, where Yoke-Sim cooked a splendid dinner out of the groceries we purchased in the morning at the Safeway in Regina. The lakeshore scenery provided the ideal background to relish our meal. Carmel and Junius were ecstatic that they had a chance to play around for a while. Highway 47 north took us to the spur road; and Highway 9 brought us back to Trans-Canada 1 at Whitewood. Heavy rains slowed down our journey considerably as we reached the Whitewood junction. Thus, our unplanned detour added an extra 51 km to our journey and cost us almost two hours of extra travel time. Some 70 km southeast of Whitewood, we crossed the Saskatchewan-Manitoba border lying between Fleming (pop. 75) in Saskatchewan and Kirkella (an unincorporated hamlet) in Manitoba. Winnipeg (pop. 633,451), the provincial capital of Manitoba, lay 330 km east of the Manitoba-Saskatchewan border. Yoke-Sim took charge of driving at Virden (pop. 3,020), stopped briefly at the MacDonald’s in Brandon (pop. 46,000) for refreshments, and guided us all the way to Portage la Prairie (pop. 12,728), which we reached at 1 a.m. Monday. Because we were thoroughly pooped out after traveling 607 km during the day, we agreed to call it quits even though Winnipeg was 84 km further away. We camped overnight at the (now defunct?) Norquay Beach Provincial Recreation Park, 16 km east of Portage la Prairie. We went to sleep confident that we could terminate our Canadian adventure Monday after a peek into Winnipeg. Dear Shelton I do not know whether you could remember me.I am residing in Winnipeg with my daughters here.I am reading your diaries which contain interesting information. I hope you will comeout with some interesting information about Manitoba and Winnipeg too. This entry was posted on Thursday, April 7th, 2011. You can follow any responses to this entry through the RSS 2.0 feed. You can skip to the end and leave a response.